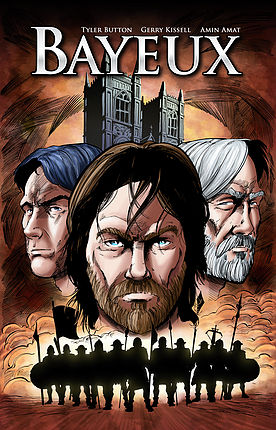 Tapestry Comics announced today that their first title Bayeux will be available in print this October. A 100% self funded campaign helped bring to life a retelling of the events that led up to the Battle of Hastings in the UK. Writer and creator Tyler Button is a former teacher and wanted to show that you can create dynamic and fun ways to teach history that students will happily engage and retain. Artists include Gerry Kissell and Amin Amat (Code Work Geronimo, Iron Sky) as well as detail work by Lee Xoper (Rock of Pages). This print cover version of this full color 124 page graphic novel will be available October 14th to celebrate the 950th anniversary of the battle. Fans can download a digital copy via Comixology https://www.comixology.com/Bayeux/digital-comic/365909. Print versions will be available at www.tapestrycomics.com, Amazon, and more. Check out the trailer now at http://www.tapestrycomics.com/#!bayeux/hf1ez. Retailers interested in carrying the book should email tbutton@tapestrycomics.com. . Press people interested in review copies should email tbutton@tapestrycomics.com.